On July 1, the Brandeis National Committee launched Magnify the Mind, an ambitious campaign to raise $500,000 for a new resonant two-photon microscope. This technology, which will support neuroscience labs and allow Brandeis scientists to increase their understanding of how the brain works, will enhance Brandeis’ research into neurodegenerative disorders. Able to take 30 to 50 images of live tissue per second, the new microscope works at a speed on par with the brain’s proc­essing speed. It can be used to take many photographs of deep tissue and neurons at a very high resolution, allowing scientists to watch synapses as they occur. “In order to understand what brain circuits do, we have to watch those patterns of activity as they happen,” says Gina Turrigiano, the Joseph Levitan Professor of Vision Science and a MacArthur “Genius Grant” recipient. Her lab will use the new microscope to advance what they know about the brain. 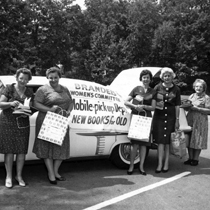 As the BNC celebrates our 70th anniversary, I want to thank you all for your continuing support of Brandeis University. Throughout our partnership with Brandeis, we’ve fully embraced and supported lifelong learning, the libraries, student scholarships and, now, pioneering efforts to help renowned university researchers reach new levels of understanding about how the brain works. Our ties with the university’s community of scholars and investigators are strong. 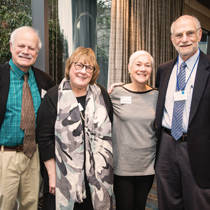 At our recent national board meeting, we were honored to welcome BNC Sachar Award recipient Steve Whitfield, PhD’72, professor emeritus of American studies, and Nobel Prize winner Michael Rosbash, the Peter Gruber Endowed Chair in Neuroscience (pictured here with BNC Executive Director Beth Bernstein, MA’90, and me). I invite you to be part of our vibrant network. 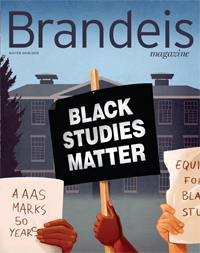 As Brandeis marks its 70th anniversary, the 25,000 members of the Brandeis National Committee, which is also celebrating its 70th anniversary, have much to boast about: Over seven decades, their organization has raised $141 million in support of Brandeis. Today, in 41 chapters across the country, the BNC continues its support of the university it helped found in 1948. 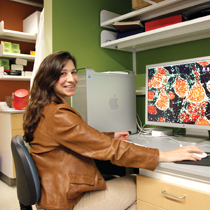 The organization has made significant contributions to Brandeis, including funding neurobiologist Piali Sengupta’s lab, enabling the expansion of the Gerstenzang Science Library, establishing the University Librarian chair and supporting student scholarships. Several BNC members will join the organization’s National Executive Committee this year: Judy Dorfman, of Somerset, New Jersey; Janice Fineman, of Newton, Massachusetts; Merle Carrus, of Hollis, New Hampshire; Audree Dyson, of East Walpole, Massachusetts; and Joy Shuman, of Greater Washington, D.C. The BNC is mourning the death of Elaine Lisberg, who passed away in April. An active member of the Tucson Chapter, Lisberg served as BNC national president from 1979-82 and was a fellow of the university.